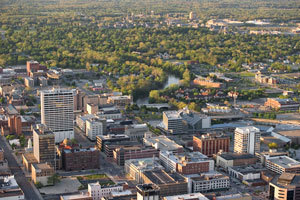 The University of Notre Dame and the South Bend Board of Parks have reached an agreement on a 50-year lease that gives the University rights to construct and operate a hydroelectric generation facility on the dam in the St. Joseph River in downtown South Bend. The agreement was approved Monday (Dec. 12) by the park board’s commissioners. The agreement transfers from the city to Notre Dame a Federal Energy Regulatory Commission exemption to operate a hydro power facility. The city received the exemption in 1984 but has been unable to act upon it due to financial constraints. In conjunction with the lease, the park’s board also approved a separate agreement in which Notre Dame will pay the city $1 million for restoration of Seitz Park, which is adjacent to the dam, as well as for ongoing maintenance of the dam through the duration of the lease. Construction of the hydro facility, which will be primarily underground, will commence in October, with full operation expected to begin in early 2019. The University will run transmission lines from the dam to campus to generate about 7 percent of its electrical needs. Gas turbine technology — The University will install combined cycle combustion gas turbines to produce both electricity and steam. These units will displace older power plant boilers with newer, higher efficiency and lower emissions sources of energy. Geothermal applications — Geothermal systems are being constructed at numerous sites across campus to support both new and existing campus buildings. Solar energy — Locations both on and off campus are potential sites for photovoltaic and thermal solar systems. Heat recovery — Numerous projects are both underway and in the planning phases to recover and regenerate energy from existing energy sources, such as the power plant’s condenser water. The two agreements are the result of a memorandum of understanding the city and Notre Dame entered into last summer. Originally published by Dennis Brown at news.nd.edu on December 12, 2016.